The Story of Creation. As you read this story, stop after the questions to allow your little one to respond by pointing to the pictures. As your child grows, let him or her read beginning words then more and more of the story to you. Your child will not only learn about God's world, he or she will also learn the deeper lesson behind the story-the lesson of God's love and power. About "Someone to Love (Me Too! Series)"
The much loved Me Too! 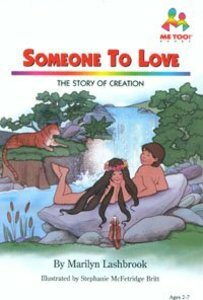 series makes individual Bible stories engaging and memorable for young children. The text includes fun interactive remarks that check comprehension and really involve children in the story. Ideal for early readers. Ages 4-8.